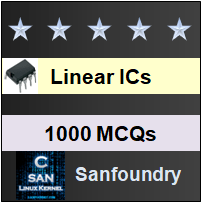 This set of Linear Integrated Circuit Multiple Choice Questions & Answers (MCQs) focuses on “PLL Applications”. 1. How to obtain a desired amount of multiplication in frequency multiplier? Explanation: The desired amount of multiplication can be obtained by properly selecting a divide by N-network. For example, to obtain the output frequency fout=5×fin, a divide by N = 5 network is needed. 2. Calculate the output frequency in a frequency multiplier if, fin = 200Hz is applied to a 7 divide by N-network. 3. For what kind of input signal, the frequency divider can be avoided frequency multiplier? Explanation: VCO can be directly locked to the nth harmonic of the input signal without connecting any frequency divider in between the input signal rich in harmonics like square wave. Explanation: As the amplitude of the higher order harmonics becomes less, effective locking may not take place for high values of n. So, the typical value of n is less than 10 for frequency multiplication / division. 5. Determine the offset frequency of frequency translation, when the output and input frequency are given as 75kHz and 1000Hz. => f1 = fo– fs= 75kHz-55kHz =20kHz. Explanation: Frequency shift is usually accomplished by dividing a VCO with binary data signal. Therefore, the logic 1 state of the binary data signal corresponds to mark frequencies. 7. Find the frequency shift in FSK generator? Explanation: Frequency shift is the difference between FSK signals of 1070 Hz and 1270 Hz frequency, which is 200 Hz. 8. Which filter is chosen to remove the carrier component in the frequency shift keying? Explanation: The high cut-off frequency of ladder filter is chosen to be approximately halfway between the maximum keying rate of 150Hz & twice the input frequency (≅ 2200Hz) which can be obtained using three stage filters.